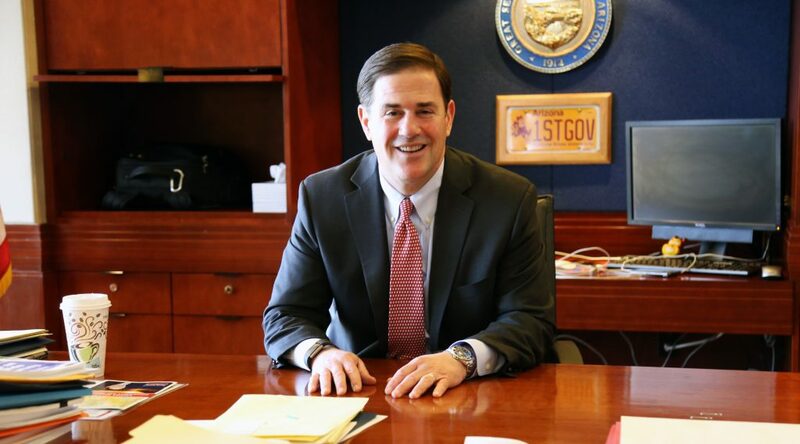 Home / Governor's Office / Look back: Did Ducey deliver on major tenets of his 2014 campaign? Gov. Doug Ducey officially kicked off his re-election campaign last week, offering up a series of campaign promises in the process. At a recent campaign event in Tempe, the Republican incumbent promised to increase K-12 education funding above inflation and drive up teacher pay. Ducey also promised to expand career and technical education options and pass his school safety plan to prevent school shootings. He also pledged to expand law enforcement efforts at the border by instituting 24-hour, seven-day-a-week police coverage in all border counties and promised to reduce recidivism rates by providing more addiction and mental health treatment for inmates. But what happened to the slew of assurances on the campaign trail four years ago? He pledged to improve the state’s economy, reduce income tax rates, cut taxes, fight the Affordable Care Act and swore not to allow any new taxes. The governor hasn’t succeeded in cutting income tax rates down to zero, let alone cutting income taxes at all. And some of his other campaign promises may as well have asterisks next to them. But Ducey clearly delivered on some of his other pledges. He managed to cut taxes every year of his governorship — one of his biggest campaign pledges from four years ago. Another of the major tenets of Ducey’s first gubernatorial campaign was to grow Arizona’s economy by reducing unemployment and increasing the number of jobs in the state. By most measures, he has delivered. Since Ducey first took office, Arizona’s unemployment rate has dropped from 7.3 percent down to 4.9 percent this spring — the lowest it has been in a decade, according to data from the Bureau of Labor Statistics. Employment jumped from 2.8 million to 3.2 million during the same time period. Of course, when Ducey took office, Arizona was still reeling from economic aftershocks caused by the Great Recession. Meanwhile, Ducey’s primary opponent — former Secretary of State Ken Bennett — is already hitting the governor on his record. Bennett’s campaign sent out an email this week highlighting “Ducey’s Broken Campaign Promises” and saying the the governor raised taxes, did nothing to secure the border and caved to the “Red for Ed” movement. Take what Bennett is saying with a grain of salt because he has proven that he will do whatever it takes to get elected, said Ducey spokesman Patrick Ptak. In responding to this story, Ptak pointed to a 10-pronged pledge Ducey signed onto during his 2014 campaign as a more accurate measuring tool for whether or not Ducey fulfilled his campaign promises. In Ducey’s “pledge to the people of Arizona,” Ducey promised to defend citizens’ 2nd Amendment rights, the right to life and pledged to appoint conservative judges and support civil-justice reform legislation to end frivolous lawsuits, among other campaign promises mentioned in this story. Ducey has always aimed to lower the state’s individual and corporate income tax rates “as close to zero as possible,” but he hasn’t succeeded in that goal. In the meantime, the governor has whittled away at the state’s taxes, making small cuts each year that he’s been in office — upholding a different campaign pledge. Lowering Arizona’s individual and corporate income tax rates may well have been one of Ducey’s loftiest self-imposed goals. Even in 2014, Ducey said that reducing the income rate would require two terms, a growing economy and a shrinking government. When he was asked about the unfulfilled campaign promise at the end of the legislative session, Ducey said Arizona faced a $1 billion budget deficit when he took office. Now that Arizona has its finances in order, the state can look toward some sort of tax reform, he said. During his time in the executive office, Ducey has chipped away at Arizona’s taxes, but never made a major dent. Ducey entered office in January 2015 facing a massive budget crisis that tied his hands when it came to major movement, or even moderate moves on tax cuts, but he still managed to pass legislation to index the state’s tax rates eliminating what Ducey called a “hidden tax increase” that returned tens of millions back to taxpayers. The following year, Ducey passed legislation that increased the amount of depreciation Arizonans can claim on new property, something they can deduct from their state taxes. He also pushed through a budget deal that carved out $18 million for minor tax reductions proposed by lawmakers. In the latter half of his term, Ducey passed a personal income tax exemption for inflation. This year, he pushed through a tax cut for veterans, though he did have to pare back his original proposal in order to free up more money for teacher pay raises. During his first term, Ducey boosted K-12 education funding, but per-pupil spending has not rebounded to pre-Recession funding levels. In his 2014 campaign, Ducey promised to veto any budget that cut education spending and vowed to expand school choice. Last year, Ducey signed into law an expansion of Arizona’s Empowerment Scholarship Account program — school vouchers that allow students to use taxpayer dollars for private school tuition. Ducey’s actions angered David Garcia — a former Democratic candidate for Superintendent of Public Instruction — to the point that he jumped into the governor’s race. The expansion also spurred the creation of Save Our Schools Arizona — a grassroots movement opposed to school-voucher expansion that is taking the fight to voters in the form of a ballot measure. In 2016, Ducey fulfilled his campaign pledge to “fully fund the wait lists” at the state’s top-performing charter schools. Ducey pushed through legislation to create the Public School Credit Enhancement Program, which is intended to give A-rated schools more favorable interest rates when borrowing money to expand their facilities. The program is largely seen as a boon for charter schools. Ducey has boosted K-12 education funding since taking office, but he got off to a rough start in the first year of his term. Ducey pushed a “Classrooms First” agenda that critics called misleading because they argued Ducey’s budget only funded schools enough to meet growth and inflation. Ducey and Republican leaders cut about $117 million in non-classroom spending in the 2016 fiscal year budget, but touted K-12 spending increases elsewhere in the budget. The catch, though, was that the spending increases were legally required because the state has to meet a certain level of per-pupil funding. State education spending has jumped from $4.4 billion in 2014 to $5.3 billion this year, which is also up from the $5.12 billion the state spent on K-12 aide in the 2007-2008 pre-recession school year. But per-pupil spending dropped from $4,949 to 4,760 during the same time frame, according to Joint Legislative Budget Committee figures. When accounting for inflation, the current per-pupil spending is $4,157. The most recent figures do not account for the hefty teacher pay raises Ducey promised that will go into effect in the next fiscal year and the two years following. There are some grays areas on whether or not Ducey held true to his vow not to increase taxes. This legislative session, Ducey extended the Proposition 301 sales tax for K-12 education funding. The 0.6-cent sales tax will renew in 2021 and last until 2041. Some have argued, extending the sales tax amounts to a tax increase — something the governor’s office and Ducey’s campaign staff have adamantly refused. This was meant as a generational funding stream for education, said Ptak, Ducey’s campaign spokesman. “The idea that this is a tax increase, when it goes into effect in two years, will anybody’s taxes actually go up?” he said. Extending the tax required a two-thirds vote of the state Legislature — a requirement of any increase in state revenues. A majority of Republican lawmakers joined all Democrats in both chambers to overwhelmingly approve the bill. In 2012, Ducey led the opposition to a 1-cent tax extension that would have permanently boosted the state sales tax rate to 6.6 percent. At the time, Ducey labeled the tax extension as a tax increase. But when he took to defending the Prop 301 extension, Ducey billed it as something other than a straightforward tax increase. “This is a funding program, and we’re going to continue a funding program,” Ducey said last year. Ducey also signed a bill this session to create a new car registration fee that will cost all motorists approximately $18 per year. Some legislative Republicans cried foul, calling the move a tax increase in disguise because lawmakers will not set the exact rates. That will be set by the director of ADOT. Per an Arizona Supreme Court ruling, agency-raised fees are not subject to a two-thirds vote in the Legislature. Ducey argues the new vehicle-registration fee does not count as a tax. “A fee is a fee, a tax is a tax,” he said when reporters asked about the new fee earlier this year. Ducey promised to cut unnecessary regulations upon entering office, and the governor’s first executive order was a moratorium on any new regulations. The governor has renewed the moratorium every year since. One of Ducey’s common talking points in speeches is that he pledged to cut 500 regulations by the end of 2017. Then he gleefully reveals that he exceeded expectations and cut more than 600 regulations, with the total number being 676 last year. The governor’s office claims the cuts saved Arizona businesses more than $48 million. Among the axed regulations are obsolete rules on lottery installment payments, several fees that hadn’t been charged by the Department of Environmental Quality in years and Arizona Department of Transportation rules that failed to differentiate between taxis and ride-sharing vehicles like Uber and Lyft. But when Ducey talks about regulations as of late, his critics tend to bring up Uber’s autonomous vehicle testing program, which the company shuttered in Arizona after one of their vehicles hit and killed a pedestrian in Tempe. Ducey didn’t cut regulations for the technology company, but he signed an executive order in 2015 aimed at luring Uber to test its technology in Arizona. Once Uber shifted its operations from California to Arizona, the company’s autonomous vehicle testing program operated with little-to-no oversight, while Ducey touted a win over California and its “burdensome regulations. Last year, Ducey, after some hesitation, gave U.S. Sen. John McCain the go-ahead to oppose the so-called “skinny repeal” of the Affordable Care Act. But despite getting Ducey’s permission to pass the bill, McCain cast a decisive vote against the repeal-and-replace plan. The day before the vote, Ducey tweeted “the bill on the table clearly isn’t the right approach for Arizona,” but the next day, Ducey granted Arizona’s two U.S. senators permission to vote for the bill, with the hope that the “skinny” legislation would be ironed out in conference committee. Ducey’s major concern throughout the process had been whether Arizona would be penalized for expanding Medicaid under the Affordable Care Act, meaning the state could potentially be on the line for millions more in health care costs. Months later, Ducey also expressed his support for the repeal plan presented by U.S. Sens. Lindsey Graham, R-S.C., and Bill Cassidy, R-La., that would turn to a block grant system to give money back to the states for them to maintain their own health care structures. At the time, Ducey acknowledged the overhaul bill was not a total fix, but it was a start to ending President Barack Obama’s signature health care policy. McCain also opposed the Graham-Cassidy repeal-and-replace plan, which may have been a blessing in disguise for Ducey as a JLBC analysis projected Arizona would lose more than $10 billion in health care funding from 2020-2026 if the bill had passed.